Located in a quiet, residential corner of Monterey, this inn is known for its romantic rooms and award winning gardens. 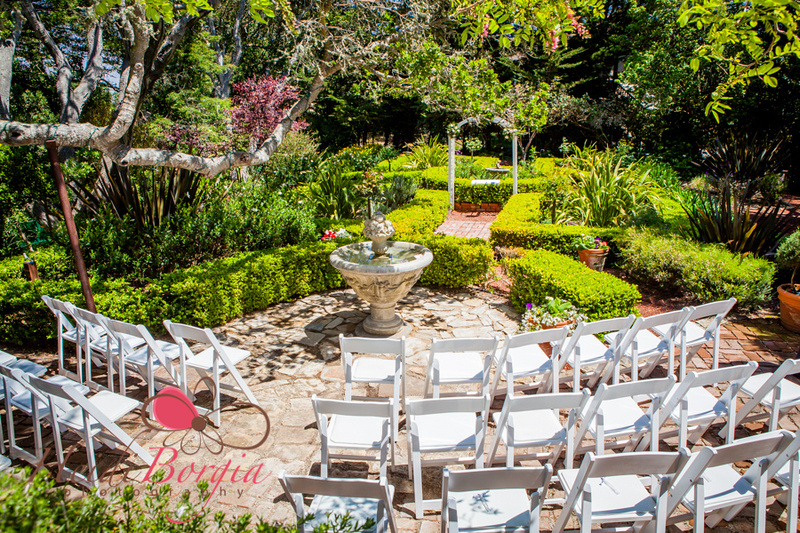 For weddings, they have a large, sloping lawn area surrounded by trees and a courtyard area (pictured above) with fountain, trees, and colorful flowers. We assist in setting up the rental but their fees are paid directly to them (they do require that you rent at least one guest room with them as well - but it is a place you will LOVE to stay!) The Inn also features a large dining room and central living room. Fees start at $1300 (which includes one deluxe guest room for two nights, champagne and etched glasses, breakfast). The innkeepers are very gracious and provide a top level of service.